In this paper, Kuroczynski et al. (Arch Med Sci 2013) reviewed the records of patients that had undergone intra-cardiac or extra-cardiac Fontan after the bidirectional Glenn surgery (the second one in staged surgeries). It is a relatively small dataset (72 patients) from one institution/hospital in Germany over a number of years (1995-2008) but I think this question is interesting and important. Understanding the potential risks and benefits of both an intra-cardiac or extra-cardiac Fontan is important. We should expect that medical science should improve outcomes and sometimes this requires paradigm shifts. For example, if an institution/hospital only performs intra-cardiac Fontan procedure, if presented with overwhelming evidence that the extra-cardiac route is “better” in the long-term (which this study does not necessarily show! ), they should reconsider their methods. 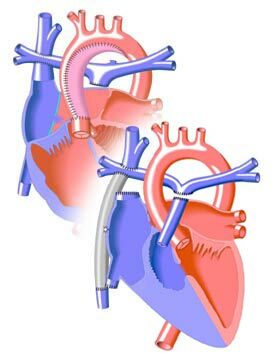 As I have discussed before, two routes are commonly used in the Fontan procedure. 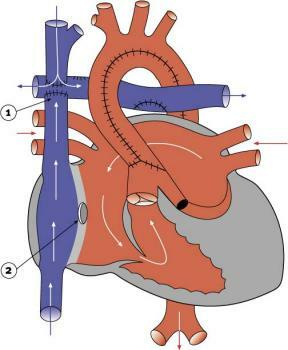 Remember that the Fontan procedure is the 3rd step for a univentricular heart and generally comes after a 2nd open heart surgery (often the bidirectional Glenn). 3) Do the extra-cardiac and intra-cardiac methods differ in their short- and long-term outcomes? 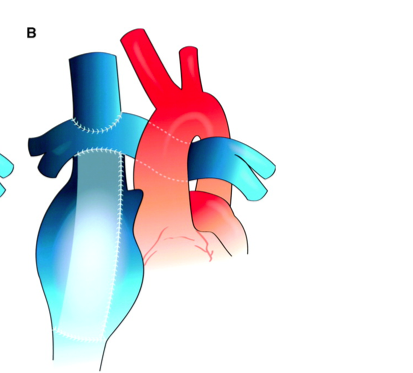 The authors suggest that the extra-cardiac method has become the method of choice more recently because i) improved blood flow, ii) less risk of thrombosis (blood clots), iii) lower chance of heart rhythm problems in the short- and long-term, iv) surgically speaking, it is easier and requires less aortic clamping, which may be advantageous (see my other posts). 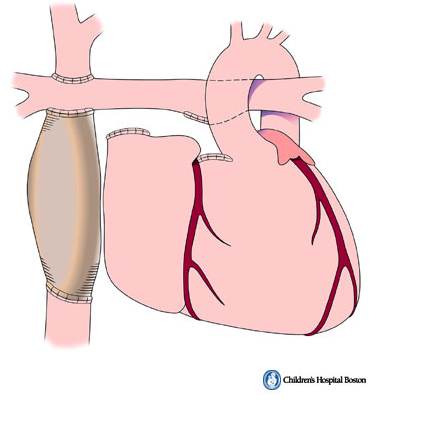 However, this is actually narrow view and, while the extra-cardiac method is preferred at some pediatric cardiology hospitals, the intra-cardiac method is preferred at others. Furthermore, this is definitely not all pediatric cardiologists agree that the extra-cardiac method is preferred over the intra-cardiac method based upon follow-up studies such as this one (Khairy et al., 2012 Circulation 126, 2516-2525). 4) What do the data show presented in this study? Although the sample sizes were extremely small (e.g., for patients with tricuspid atresia, they performed 9 intra-cardiac Fontan and 10 extra-cardiac Fontan), the results are still interesting. However, keep these small sample sizes in mind as well as the fact that these data were collected from 1995-2008 and the type and level of treatment has likely improved for patients undergoing the Fontan procedure over that time period. 5) Patients undergoing the intra-cardiac method spend MORE time on cardiopulmonary bypass than patients undergoing the extra-cardiac method. The amount of time spent on cardiopulmonary bypass for the intra-cardiac Fontan was greater (median = 170 min, range = 50-399 min) than the extra-cardiac Fontan (median 104 min, range = 53-247 min). Most studies (including this one) generally show that spending more time on bypass is not good in the short- and long-term. However, it is again hard to identify cause and effect here given that patients with more complex heart defects will necessarily spend more time on bypass. 6) Patients undergoing the intra-cardiac method (median = 39 hours) spend MORE time on a ventilator after the Fontan procedure than patients undergoing the extra-cardiac method (median = 21 hours). These numbers (the median # of hours spent on ventilator) seem crazy high. A predictor of the length of time spent on the ventilator was the amount of time with aorta cross-clamped (which might reflect a more complicated surgical procedure so not surprising longer time on ventilator). Age and weight at which the Fontan was performed did not impact amount of time on ventilator. 7) Patients undergoing the intra-cardiac method (median = 19.5 days) spent MORE time in the intensive care unit recovering from the Fontan than patients undergoing the extra-cardiac method (median = 14 days). Again, it would be important to know how these values changed over the years as this may have gone down from what it was in the mid 1990’s. Age and weight at which the Fontan was performed did not impact amount of time in intensive care unit. 8) Patients undergoing the intra-cardiac method (median = 48 hours) had to receive greater inotropic support with catecholamines (basically how long they received drugs like dopamine to help their heart beat properly) than patients undergoing the extra-cardiac method (median = 10 hours). Summary: Taken together, this study shows that there were major advantages for performing the extra-cardiac method over the intra-cardiac method. Patients that underwent the intra-cardiac method spent MORE time i) on cardiopulmonary bypass, ii) on a ventilator, iii) on drugs that helped heart contract, iv) in the intensive care unit. All of this is interesting but it doesn’t prove that intra-cardiac method is worse than extra-cardiac method as this is one study with a small sample size of patients from one institution over a long period of time where how patients needing the Fontan procedure are treated has changed. Caveats: Why the authors did not report presence/absence of heart rhythm problems is unknown but would have been interesting. Although they found that age and weight at Fontan completion didn’t affect the outcomes, the authors also discuss that they prefer to do the Fontan at a later age (median patient age of Fontan completion was 3.2 years in this study). Using the extra-cardiac method generally requires patients to be older so that changing the length of the conduit (extra-cardiac tunnel) can be avoided as the patient gets older and grows. However, this has to be balanced with the fact that performing the Fontan at a later age can damage the normal ventricle (Mair et al., 2001).